No cruiser wants to get suckered into a bad meal in Barcelona. Most visitors who arrive to Barcelona by cruise ship only have a limited time to experience the city. They want to use the few precious hours they have to eat good food and avoid the touristy places filled with greasy and/or frozen food (they’re everywhere)! The Ultimate Cruiser’s Guide to Eating in #Barcelona – Retweet! So, as a nod to Barcelona’s brief-but-enthusiastic visitors who are searching for the best Barcelona tapas and the best Barcelona restaurants for cruisers, we’ve created the Barcelona Experience Ultimate Cruiser’s Guide to Eating in Barcelona. You’ll get three restaurant recommendations today. Stay tuned for our upcoming list of seven popular tapas you must try when you visit Barcelona! And….don’t forget to email us about your trip. We’ll set up a tapas tour that will make your tastebuds shout for joy and make your cultural conscience thank us for helping you avoid the tourist traps and enjoy authentic, well-made Barcelona food (our secret places aren’t on this list…sorry!). Choosing the right restaurant for your brief Barcelona shore excursion can be tough. There are literally thousands of choices. Narrowing down the places with good food and convenient location is nearly impossible for cruisers. 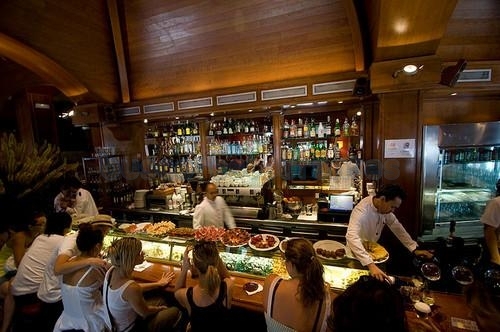 Ciudad Condal is a great place for a meal because the prices are reasonable, the restaurant is located near Plaza Catalunya and the food is great — this is the perfect combination for the Barcelona cruise crowd. Here’s a tip: the Spanish name for the restaurant is Ciudad Condal, but the Catalan (regional language) name for the restaurant is Ciutat Comtal! Most visitors head to Cerveseria Catalana, Ciudad Condal’s bigger (and waaaaaay busier) cousin. Stick with Ciudad Condal, we say…it’s cosier, less crowded and the food is fantastic. Orio specializes in Basque food, the eats from Northern Spain which have made the country one of the world’s leaders in culinary innovation and is home to some of the best restaurants in the world. The restaurant has delicious pintxos, which are bite-sized tapas speared with a toothpick. Try the sobrassada con miel, a very Spanish mouthful of baguette, spreadable spicy pepporoni-like sausage and a touch of honey. The restaurant, whose name is Catalan for 111, is located on the ground floor of the five-star grand luxury Le Meridien hotel. Cent Onze serves a delicious lunch meal. It’s a few euros more than what you’ll find on Las Ramblas, but the quality of the food is superior. They have a daily lunch menu for about 17 euros and the restaurant is really cool and quiet but you can still see all the people walking by on Las Ramblas. 1. Patatas bravas. The Spanish french fry. They’re usually served with a garlic-based sauce and sometimes a mild red sauce. You know you’ve found a good plate of bravas when they serve romesco sauce with your patatas, a sauce invented in Spain that includs red bell peppers and almonds. 2. Jamón. Thin slices of aged ham with ratings ranging from 1 “j” to 5. It’s earthy, salty, velvety and utterly amazing! 3. Pimientos de padron. Little green peppers that aren’t spicy and are cooked in a little olive oil and sprinkled with sea salt. Delicious! 5. Clara – A tasty little summer drink that’s a mix of fizzy lemonade and beer. It’s more of a local thing that we think you’ll enjoy if you like beer. Another popular name for them is “shandy”. If you aren’t into beer, try sangria with cava! 6. Pintxo moruno (sometimes spelled pincho moruno) Marinated chunks of pork. So delicious, but people usually don’t order them. Think of a thick pork chop diced into squares and seasoned with delicious spices. 7. Crema catalana – This is a classic dessert from Catalonia. It’s similar to creme brulee but its different. Sometimes it will have a zesty lemon taste to it and other times it will taste more like vanilla. Also, be prepared…it’s not going to come in a dainty little dish like creme brulee! 8. Croquetas. Cheese or chicken mixtures rolled in bread crumbs and fried. They are delicious. Which Tapa is Your Favorite?